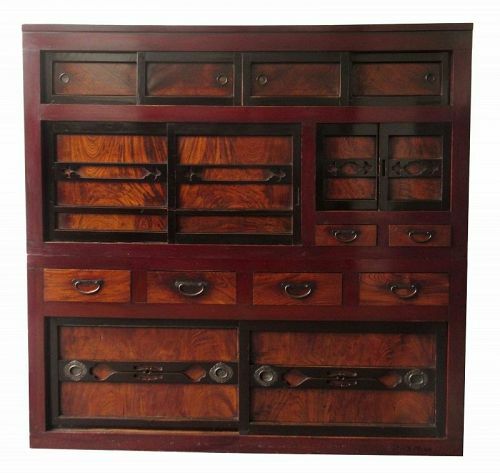 Antique Japanese 2 section 6ft Mizuya with dark red lacquer frame made of Hinoki (cypress) wood, with Sugi (cedar) sides, and Keyaki (elm) burl hardwood front panel drawers and sliders edged with black lacquer frame. From the Kanazawa region. Kanazawa is the capital of Ishikawa Prefecture, on Japan’s central Honshu Island. It's known for well-preserved Edo-era districts, art museums and regional handicrafts. Japanese calligraphy box made with Keyaki (elm) wood in original dark red lacquer finish. 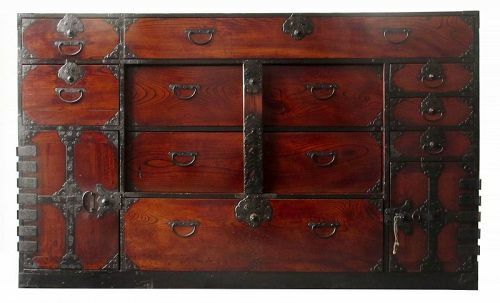 The lid lifts open on three iron hinges with a top iron handle to a shallow lacquered compartment for storing calligraphy papers, and closes securely with a small iron latch. 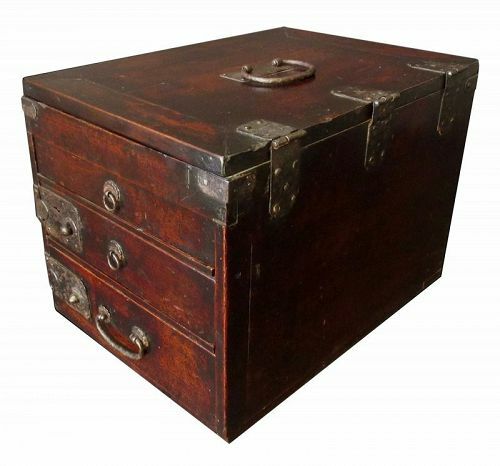 The front of the box holds three drawers with iron lock plates and handles on floral shaped iron mounts. 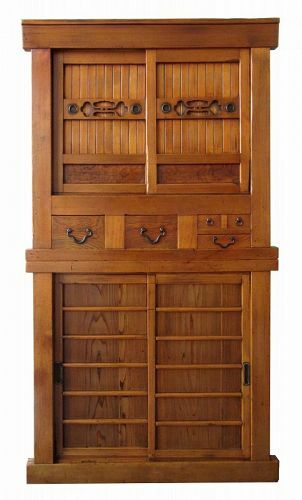 Antique Japanese half section Mizuya, or kitchen buffet tansu, made of Hinoki (cypress) and Sugi (cedar) wood frame. 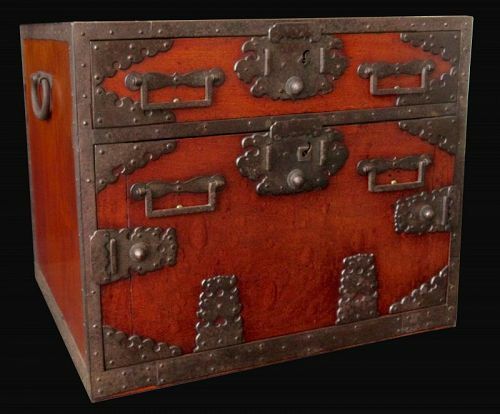 The chest has bold Keyaki (elm) front drawers along the bottom and right side with copper handles. 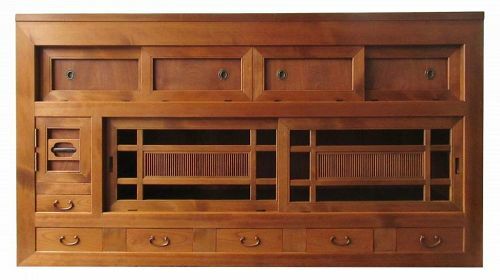 The large sliding front panels are reinforced with attractive horizontal slats, and open to the large interior compartment. 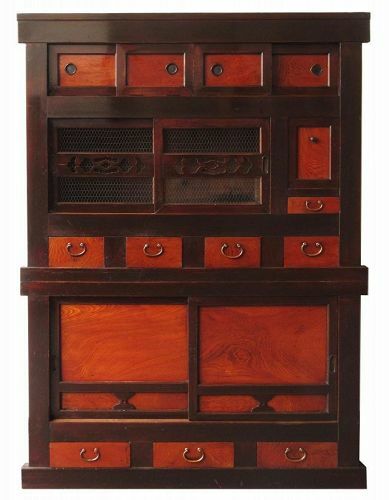 Japanese half section Mizuya (kitchen buffet tansu) with four Keyaki burl front panels opening to a wide, narrow open space along the top of the chest. 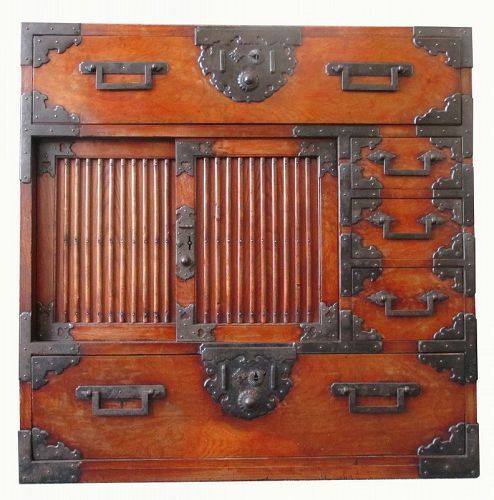 Below this are two large openwork sliding door panels of geometric design, with a small door to the left opened by a hidden Persimmon wood latch. 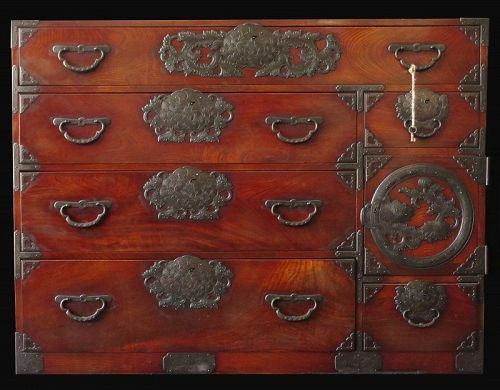 Six drawers with Keyaki burl faces are lined along the bottom of the chest, with brass warabite pulls.